An A2 level ESL lesson plan for teaching personal pronouns. It includes a lead-in activity, several classroom activities and games, and a collection of free resources from around the web. The recommended way to view these materials is through the TEFL Handbook app, which gives you offline access to everything on the site. The board work below highlights one way to review personal pronouns for students at this level. Start off by writing a sentence on the board that contains a subject, object and possessive pronoun. Have the students identify each of these and highlight it on the board. Finally, as the colour-coded text suggests, the students will work in groups to complete all of the object and possessive pronouns. 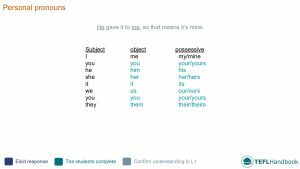 For this ESL writing activity, the students will work in groups to come up with example sentences for the object and possessive pronouns. Encourage them to try and combine them like the example sentence from the board work. Add a few more examples to help them. 1. John likes Mark and Peter’s dog. 2. The freezer is broken. 5. My dad gave my brother and I some money. 6. Arsenal is an excellent team. E.g. 1. He likes their dog. What present did you get him? What presents did he get? Our suggestions for ESL games and activities require the minimum of resources (whiteboard and markers). 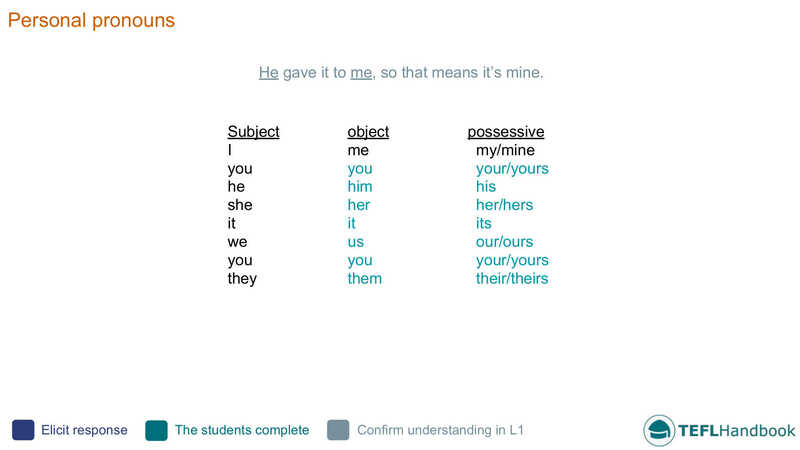 For personal pronouns, we have one idea for a fun classroom game that you can try. You’ll need dice or dice app on your phone (There are plenty of free ones out there.). Divide the class into two teams and make three lists of 6 random subjects, objects, and possessive pronouns and number them. Also, add a list of 6 random verbs and number them. On each turn, you'll roll the dice four times and mark the numbers on the board. In groups, the students must come up with a funny sentence that uses as many of the pronouns as possible, along with the verb. Give one point for each correctly placed pronoun and a bonus point to the team with the funniest sentence. Set a time limit based on the ability of the class. If you've found these ideas useful, have a look our complete list of ESL lesson plans for elementary level students, A2 lower and A2 upper. For other levels, see our entire collection of ESL lesson plans. Our suggested next lesson is on the past simple and past continuous.